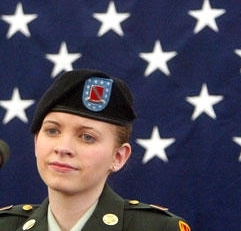 The false narrative that the Pentagon cynically concocted the tale of her battlefield derring-do in Iraq has accompanied Jessica Lynch to Idaho, where she is to deliver a speech today on the Fourth of July. 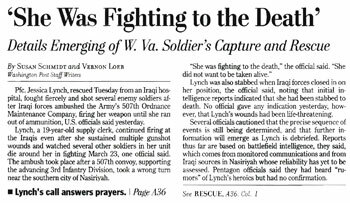 News reports in advance of Lynch’s appearance have said the Pentagon was the source of the erroneous report that she fought fiercely in an ambush in Nasiriyah in March 2003 — an engagement in which 11 American soldiers were killed. But as I discuss in my media-mythbusting book, Getting It Wrong, the tale of Lynch’s purported heroics was thrust into the public domain not by the Pentagon but solely by the Washington Post. The Post in a sensational, front-page story published April 3, 2003, said that Lynch, a 19-year-old supply clerk in the Army’s 507th Maintenance Company, had fought fiercely in the attack at Nasiriyah, suffering gunshot and stab wounds while firing round after round into the attacking Iraqis. The article was thoroughly wrong. Bogus. Schmidt and Loeb were misled by their sources, who to this day remain unidentified. Lynch never fired a shot in the fighting in Nasiriyah. She was neither shot nor stabbed. The fleeing Humvee was struck by a rocket-propelled grenade, which sent the vehicle crashing into a disabled tractor-trailer just ahead. Lynch suffered shattering injuries; the four other soldiers in the Humvee were fatally injured. Lynch was taken to an Iraqi hospital where she lingered near death before a U.S. special forces team rescued her on April 1, 2003. Over time, the singular role of the Post in the bogus hero-warrior story about Lynch has faded. In its place has emerged the false narrative that the Pentagon made up the story to bolster popular support for the war. But as I note in Getting It Wrong, the Pentagon wasn’t the Post’s source for the bogus hero-warrior tale. We know that from an interview in December 2003 on NPR’s Fresh Air show program. On that show, Loeb said he “could never get anybody from the Pentagon to talk about” Lynch’s purported heroics. “They wouldn’t say anything about Jessica Lynch,” Loeb declared. Despite Loeb’s exculpatory comments, the erroneous interpretation that the Pentagon concocted the story about Lynch’s heroics has taken hold and lives on — in part because it corresponds well to a view that the war in Iraq was a thoroughly botched affair. The erroneous references to the Pentagon in advance stories about Lynch’s Fourth of July talk near Craigmont, Idaho, underscore anew why the Post ought to identify the sources who led it astray on Lynch’s supposed heroics. By doing so, the Post will help to debunk a malicious false narrative and help set the record straight. And after all, that’s what journalism is supposed to do.